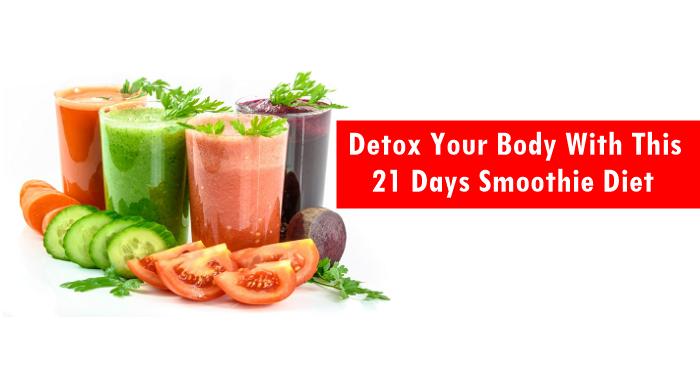 Detox Your Body With This 21 Days Smoothie Diet - The more we eat the junks, the more toxins, and parasites pile up in our bodies, causing us to get sick with several different types of diseases. Some of which is said to be incurable! So many people suffer every day because of what they eat, how they eat, and the time they eat. We must not live to eat, but we must eat to live; eating healthily is the only way this can be accomplished. I myself have been guilty of not eating healthily because I was not properly educated and about 8 years ago, I have made a change for the better, where I try my best to eat as healthfully as I can and trust me, I have seen great changes. During my experience, I have come to realize that there are bad news and good news regarding our health. The good news: Many, if not all of these health issues can easily be fixed with this 21 Days Smoothie Diet. This smoothie diet is designed with healthy fruits and vegetables that will boost your immune system, rid toxins and parasites from your body, and even get rid of your bloated tummy. The smoothies included in the 21 days smoothie diet are all natural, delicious, easy-to-make smoothies for weight regulations, increased energy, & incredible health! With this 21 Smoothie Diet, your life will be transformed, your body will feel fresh, you will feel younger in years and you will be glad you have tried it.